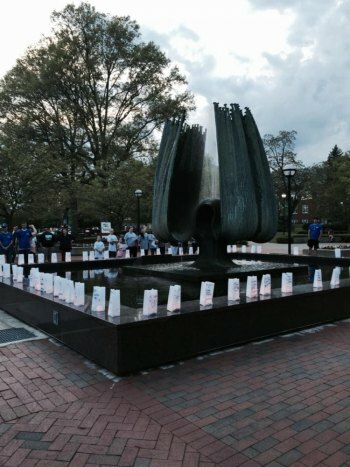 HUNTINGTON, W.Va. – Marshall University’s Suicide Prevention Education Across Campus (MU-SPEAC) grant funded program will host the 3rd annual Walk for Hope: Campus Suicide Prevention and Education event 6:30 to 9 p.m., Tuesday, April 16 on the university’s Memorial Student Center plaza. Paula Rymer, a faculty member in the Master of Social Work program, said Walk for Hope originated a few years ago with a local walk she organized in eastern Kentucky to promote education and awareness in the areas of suicide and mental health. “The second highest rate of suicides happen in the 14- to 24-year old age group. We have found addressing mental health issues for students on campus increases retention rates and lowers alcohol and drug use on campus,” Rymer said. Rymer said our society has to promote talking about mental health and wellness because we lose too many young adults to suicide every day. The Walk for Hope will kick off at 6:30 p.m. with good music, positive energy and personal testimonials from individuals in the community who have been affected by suicide. Rymer said the event is free and open to the public and will host guest speakers, musicians and luminaries in honor of those who have been lost. The Huntington community is encouraged to attend. The MU-SPEAC is a federally funded match grant that is named for Garrett Lee Smith, son of former senator Gordon Smith. The purpose of the Garrett Lee Smith Campus Suicide Prevention grant program is to develop a comprehensive, collaborative, well-coordinated, and evidence-based approach to: (1) enhance services for all college students, including those at risk for suicide, depression, serious mental illness, and/or substance use disorders that can lead to school failure; (2) prevent mental and substance use disorders; (3) promote help-seeking behavior and reduce stigma; and (4) improve the identification and treatment of at-risk college students so they can successfully complete their studies. It is expected that this program will reduce the adverse consequences of serious mental illness and substance use disorders, including suicidal behavior, substance-related injuries, and school failure. To learn more about Marshall’s Walk for Hope, contact Rymer by e-mail atrymer13@marshall.edu or by calling 304-696-5770. For more information on activities sponsored by the Department of Social Work and the Marshall University Suicide Prevention Education Across Campus (MU-SPEAC), visit www.marshall.edu/social-work.